A special church service of thanksgiving has been held in memory of the last man to play both cricket and football for England. Arthur Milton, who died recently aged 79 in Bristol, made six Test appearances for England between 1958 and 1959. His sole cap for the national football side came in a 2-2 draw with Austria in 1951. The service took place in Westbury-on-Trym in Bristol on Tuesday. 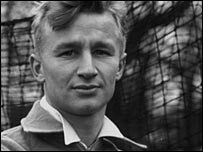 As a footballer, Mr Milton scored 21 goals in 84 appearances for Arsenal and was a member of their First Division title-winning side in 1953. He joined Bristol City in February 1955, helping them to promotion to the old Division Two before retiring from the game at the end of that season. In cricket, he enjoyed a successful 26-year career with Gloucestershire, and took one cap for England in 1951. Mr Milton captained the side in 1968 and scored more than 32,000 first-class runs with an average of 33.